Every once in a while a free application or service comes along which makes us wonder why the thing is being given free. The app or service could generate huge profits by selling it to consumers, but the developer doesn't do that. Google services (Gmail, Maps, Search) would be a good example of this. In this article we will look at one such Android app. We may be slightly exaggerating the nature of this app by comparing it to Google’s set of services, but the Gmote app – which we are reviewing today – makes us still wonder why it is free. Regardless of the fact that our primitive mortal minds are unable to comprehend the zero-cost of this app, the Gmote app still continues to exist in the Android Market for a sum total of nothing - which made it a prime candidate for our weekly review. Why do we like it so much? You're going to have to click through to find out. 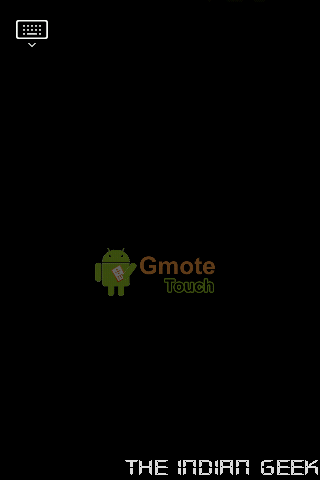 Gmote – presumably “G” for Google and “mote” for remote - is an app which converts your mobile phone into a touch screen remote control for your personal computer (PC). The latest version of the app also supports media streaming to your Android device. We know that having a touch screen remote for your personal computer would be cool, but a wireless router is a pre-requisite for this app to work. We will now walk you through the steps required to get the app working. Step 1 Download the app from the Android Market and install it on your Android device. Step 3 Launch the Gmote app on your Android device. The software will search and find the Gmote server and ask you for the password. In certain cases, we had to find the IP of the PC, and manually enter it on the Android device. Once the password has been entered, you’re good to go. 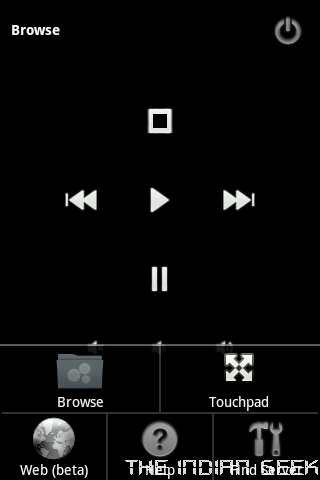 You can use the Android device to browse through and control your media on your pc. 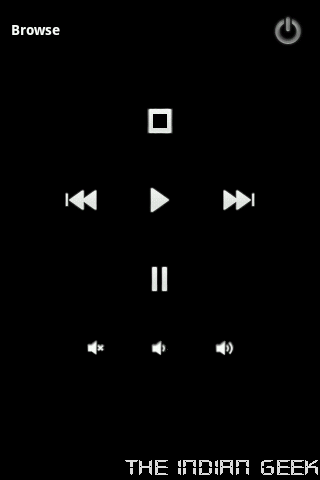 The latest version allows you to listen to music and view pictures on your Android device itself. Other functions involve using your Android device to control Powerpoint (we haven’t tested it with OpenOffice.org Impress – but we doubt it would work) and slideshows of pictures on your PC. The reason why this app amazes us is that usually, alternative methods to control media remotely will involve some kind of extra investment mainly in terms of hardware. In this case you will be using your existing devices to perform actions tht have been non-existent so far, for free. The touch screen remote part of the app worked extremely well with our Android devices for audio, images and video (including divx, mp4 and mkv formats). When we tried to stream compressed video onto the Android device, the results were disappointing – from what we could see, the video needs to be something which the Android device can natively playback on its own, which kind of beats the whole point of trying to stream video from a PC wirelessly. 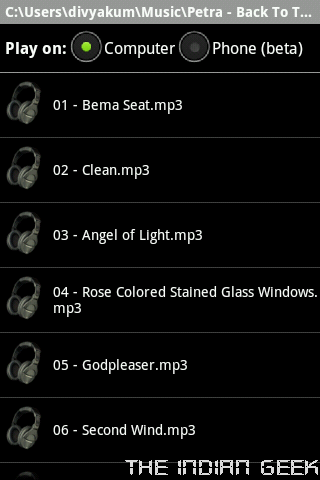 On the other hand, music streaming (mp3 format) worked well. Let us remind you that the streaming function is in the experimental stage, so we are expecting better results with the next version. There was also a web video feature where the developer tried to integrate Youtube, Hulu and Google video into the app. This feature was in beta stage and so (we presume) did not work well at all. The response time for the app was generally good even though we had shared over 38 GB of audio files and over 33 GB of video with the device (in one case). However, the app hangs when we returned past the initial opening screen. This app is definitely recommended to all Android users for two simple reasons: ease of control over your audio and video files on and off your pc and for the fact that the app is free. Even though we found glitches on the app, we found the app more or less pleasant to work with, and mighty useful. If we could rate it, we would give it a 4 out of 5. So, stop reading this review, grab your friendly Android device and hit up the Android Market – a copy of Gmote is waiting with your name on it. Seriously. This is a wonderful app that I have been using for months. I just wish it had the port forwarding ability to stream outside of your own WIFI network. I hope to see that update in the future, but until then I will be using my Remote Access app. I am a DISH Network subscriber/employee, and I use their app to stream live TV, DVR recordings, and on demand content remotely to my Android. Thank you for the info. Yes, this app is amazing - but it still lacks some well-rounded edges, and certain key features. We can't blame the app, because for the cost of nothing - it's well worth it. Thank you for letting us know about the Dish TV app for remote viewing - we hadn't heard about it previously. We're glad that you let us know.